"Why is that hanging in your shower?" friends used to ask Caroline Owusu-Ansah when they'd come over to her house in high school. What they were gesturing to was a long cut of mesh, much like tightly woven fisherman's net made of nylon. A first-generation Ghanaian growing up in Boston, Owusu-Ansah found it odd to have her friends question something so commonplace in her life. She had grown up using the mesh body exfoliator—it was something used by West Africans for generations (as Owusu-Ansah assures, you'd find it in any Ghanaian or Nigerian home in the States). But to her friends, it was a mystery—a strange object to find simply hanging in a classmate's bathroom. What they certainly didn't know was that it was the West African secret to super-smooth skin. Now, the miracle exfoliator is readily available to anyone seeking smooth, beautiful skin, thanks to Owusu-Ansa and her company, Luv Scrub. But from those first inquiries from high school friends, the brand took some time to come to fruition. We had Owusu-Ansah fill us in on the journey (and everything we wanted to know about the product). It was one of these awkward bathroom occurrences that sparked the beginnings of Luv Scrub, shortly after Owusu-Ansah graduated from college in 1999. "My best friend, she's white, came to stay with me," recalls Owusu-Ansah. Instead of asking questions, her friend used her mesh exfoliator without asking. In fact, she loved it so much that when Owusu-Ansah's parents went back to Ghana (they're from Kumasi from the Ashanti tribe), she had them bring one back for her. "At the time, I didn't think of it as a business. It didn't click then." Three years later, at a party in Brooklyn, someone complimented Owusu-Ansah on her skin, and that's when she thought to transform her tried-and-true exfoliator into a business. Owusu-Ansah knew there was nothing like the mesh exfoliator she grew up with on the market, so she used her education and experience in retail merchandising and branding to build a brand around the traditional West African bath tool. She saw an opportunity to bring the product to the people before they even knew enough about it to create a demand. She sent samples to a high-end spa in Boston, and a few days later they called back and wanted to place an order. "I did it more as a hobby," Owusu-Ansah says of the early days. After taking a break from the project, years later she started again as an actual business, this time wanting "to do it with intention," she notes. Ahead of the official relaunch in December 2016, Owusu-Ansah refined the product itself, gave it an identity, branded it, gave it the name, Luv Scrub, and designed the packaging. 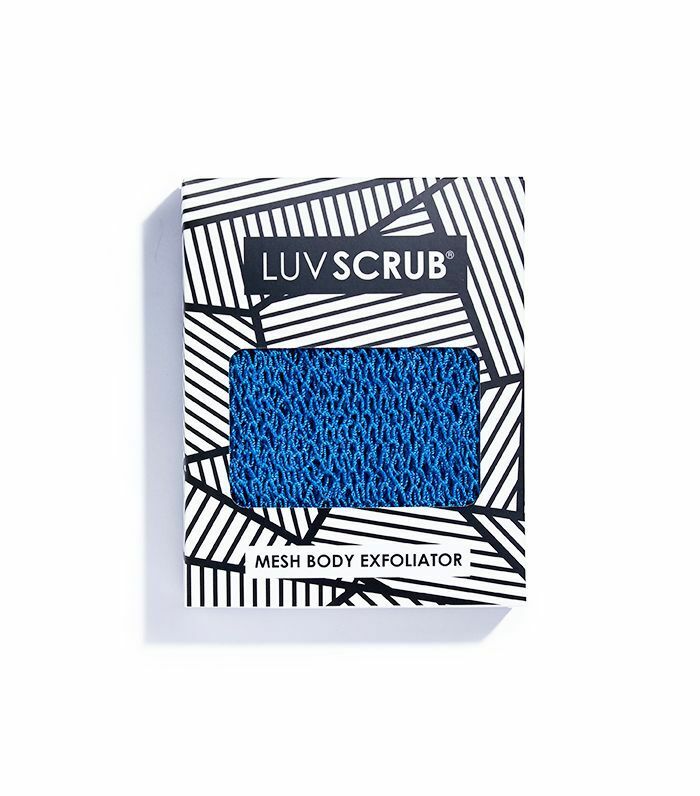 Now Owusu-Ansah's Luv Scrub is available at Urban Outfitters and the Luv Scrub site. She says that since its widespread success, she's constantly hearing feedback from fans about new uses. For instance, she's heard from customers that it helps with ingrown hairs and even people who have keratosis pilaris. Users say Luv Scrub is also great for back acne, plus it can be used to exfoliate before self-tanning or getting a spray tan. "You don't have to go out and buy additional tools," says Owusu-Ansah. "It doesn't breed bacteria like other back tools," and you can easily clean it with hot water and let it air dry. You can use your Luv Scrub for up to 18 months, which is a huge difference compared to the lifespan of a typical loofah or sponge. Owusu-Ansah says that people got wind of it back home and it went viral. "They were so amazed that I actually put it in a box, gave it a brand name, and sold it to Americans," she says. "Everyone's very excited, and they're very proud." Head below to get your hands on your own Luv Scrub to test it for yourself. Looking for more global beauty secrets? Discover seven genius beauty tips we've learned from around the world.